My background is ranching. I was born and raised on a cattle and horse ranch in the Sandhills of Nebraska - Grant County (southwest of Whitman). My family moved from there and I went to high school and later, the University of Missouri-Columbia. I majored in beef cattle nutrition, reproduction and economics. I ventured back to Nebraska and worked for the University of Nebraska at North Platte under Dr. Don Clanton. Dr. Clanton managed the beef cow-calf on range and the feedlot programs at the facilities in North Platte, Tryon and Whitman. He was also an original Simmental cattle enthusiast. I moved back to Missouri and took over my dad's farming/ranching operation when he died suddenly in September 1996. Loading and shipping cattle to pastures and feedyards. Since 1997, I have retained ownership on my calves and feed them at Anderson Livestock in Arapahoe, Nebraska. I have always practiced financial risk management with my feeder cattle. Nearly 100 percent of my calves are eligible to be harvested at Cargill Meat Solutions at Fort Morgan, Colorado. The goals of the feeder cattle program are to produce fed cattle that market in the top 25% in the nation, hot carcass weight averages of 885 pounds, quality grades of 70% choice or better, 70% yield grades 1-2, no out/discount carcasses, feed conversions of 6.2 or better, average daily gains of 3.00 lbs./day or better, dressing percentages of 64% or better, ribeye areas of 12-15 square inches (all these figures are for feeding mixed pens of steers and heifers), low incidence of feedyard morbidity and no mortality, and cattle being harvested at an age of 13-15 months. 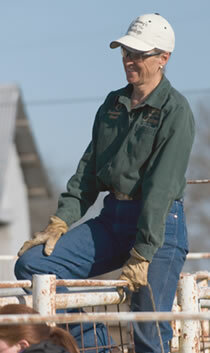 At the ranch, the goals/objectives are to maintain a closed cowherd that is BVD-PI3 free, Johnnes-free and scour-free. My calving seasons average 37 days. From a genetic perspective, cows and bulls need to be easy keepers and productive on pastures which are nearly 100 percent fescue (a cool season grass that is generally low in quality). I had used Blue Heelers or Australian Cattle Dogs since the 1970's and my last Heeler was 21 years old and not able to help with the daily cattle work. I needed to replace Claire (my last Blue Heeler). In July 2002, I went with a friend to Kansas to watch Charlie Trayer work a few of his cowdogs. I stood on the back of the flatbed pickup and watched three of his cowdogs gather and bring a set of yearlings back to the pickup. Hangin' Tree cowdogs became the replacement cowdog choice on that day in July 2002. I got my first Hangin' Tree cowdog as a weaned pup from Charlie in August 2002 (Bert). During Bert's first 4 years, he and I did all the work ourselves. In 2006, we picked up Hawk from Charlie. Together, Bert (Bob × Lil) and Hawk (Zip × Sage) have produced some really nice and effective working dogs. Since Bert, I have not had any other breed of dog. In January 2008, I purchased the business of Trayers' Cowdogs from Charlie Trayer. He stated he was retiring from the cowdog business and wanted me to purchase his cowdogs and keep the breeding program going. I purchased 16 cowdogs that were to represent his original foundation Hangin' Tree cowdog bloodlines of Smoke, Sally, Bob, Lil and Sage. These cowdogs were also direct or close descendents of cowdogs produced by Gary and Choc Ericsson. A few of the purchased cowdogs, along with Bert and Hawk are the basis of my cowdog breeding program. Good genetics go a long way in producing cowdogs that are headers, heelers, tough, savvy, lots of natural cow sense, good listeners, easy to train, loyal, dependable, easy keepers and great friends. My cowdog program goals and objectives focus on producing cowdogs with the natural abilities and natural desires to be loyal, intelligent and hardworking. I have a great appreciation for cowdogs that are easy to train. I enjoy cowdogs that love to learn and work cattle. I do not enjoy hard-headed cowdogs and believe you don't have to have a hard headed cowdog in order to have a tough dog. I want my cowdogs to get the job done without causing lost time and stress to me or the cattle. I also want my cowdogs to be able to respect all classes of cattle and know when to apply pressure and know when to willingly have the sense to back off and go with the flow. Handling baby calves is not the same as handling yearlings, cows or bulls. Settling a cow to an AI servicing is more successful if she is not chewed on and hyped up by the time she gets to the chute. The foundation cowdogs used in my breeding program received their permanent registration papers from the American Cowdog Association which is now a part of the Hangin’ Tree Cowdog Association. A few years ago I made the decision to stop submitting my litter information to the club. My litter certifications were being used on pups and cowdogs that I did not breed or raise and I was receiving calls from people who thought they had papers and/or pups from my program. Problem was, the pups or cowdogs were not from my program. I could not help the people with their problems or issues simply because I did not breed or raise the pups or cowdogs they were calling about. If you ever need some cowdog help or just want to visit about cowdogs, give me a call or e-mail me. If you'd like to visit the ranch and watch the cowdogs work cattle, I'd be glad to work with you to set up a time for you to visit us.